The quiet, pastoral areas of San Luis Obispo County might get a lot more interesting in the coming months. The Board of Supervisors unanimously voted March 13 to amend the county Land Use Ordinance to include provisions and permit standards that would allow people to build structures related to commercial zip lining, mountain biking, bungee jumping, cable skiing (think wake boarding, minus the boat), and more. WHEEEEE! 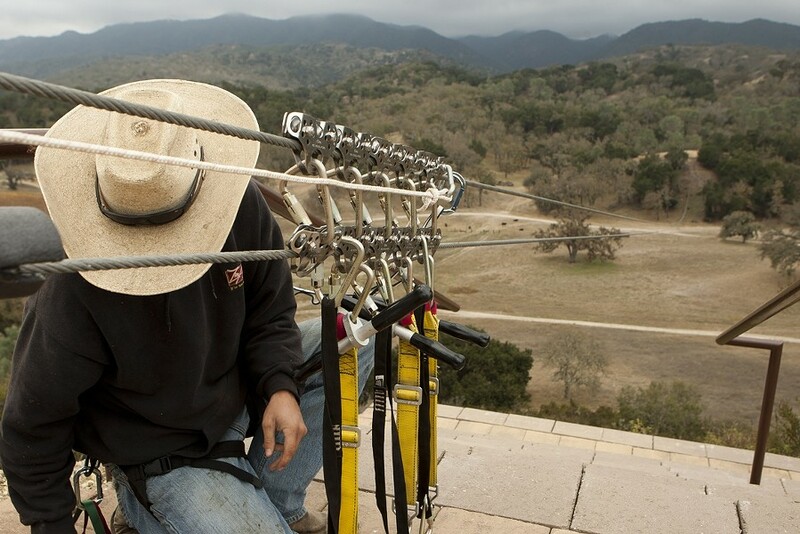 : With a nod from San Luis Obispo County supervisors, operations like the zip line at Santa Margarita Adventures will receive better definition in county code books. “With the exception of bungee jumping, every single one of these uses has actually had a fairly recent question come in at our permit center,” said Kami Griffin, assistant director of the Planning and Building Department. Griffin and other staffers couldn’t answer those questions, because current language in the ordinance is oddly silent on the subject of giant swings. The ordinance does allow for recreational uses “like” camping and hunting, but is zip lining like camping? Staffers were stumped, so they brought the issue to the supervisors for interpretation. The poster child for the ensuing discussion was Santa Margarita Adventures, an “agritourism” outfit that provides aerial tours of the historic Santa Margarita Ranch via zip line. The general consensus was that the tour had relatively little environmental impact. It was deemed secondary to the land’s primary agricultural use; therefore, it should be allowed. The board’s decision allows staffers to begin the process of establishing specific permit standards and codes for these types of rural recreation activities. Griffin said that any large-scale construction requiring grading permits for new roads or extensive tree removal would most likely fail to meet the standards. Still, steadfast rules won’t be in place for quite a while. “Realistically, this process will take a year or more,” said Supervisor Jim Patterson. In the meantime, supervisors granted Building Department staff the power to make decisions on a case-by-case basis, encouraging them to err on the side of caution when issuing permits.